The O’Connor family has been vacationing in Wellfleet at the Rogers/O’Connor cottage on Ocean View Drive since the 1930’s. Through the years the cottage has been passed on to the 3rd generation of O’Connors. (We now own 1/42 of that cottage). Continuing this tradition, we would come and visit with our young family when Nana and Grampa were staying during their 2 weeks in July. At times we would stay with them and other times we would rent other cottages around Wellfleet. We had a dream of finding a place of our own. So we started looking at houses and cottages for sale in Wellfleet (not very seriously at first). In the 90’s, before everything was available on Zillow and other websites, we would keep our eyes open for properties for sale as we drove around Wellfleet during our vacations. Most of these houses had a realtor box outside with the listing sheets available. We developed our search into a game. Before we would grab the listing sheet we would take a guess at the listing price of the property to see who was closer. “$700K, $800K? No, we were both too low. It is $1.2MM!” Inevitably, everything that we liked was way more expensive than what we could afford. This went on for years. Fate certainly appeared to share a part in the discovery of Hidden Hollow. In the summer of 2006 we had already taken our 2-week July vacation when our cousin Mary Rogers called us to say that one of our other cousins had something come up. 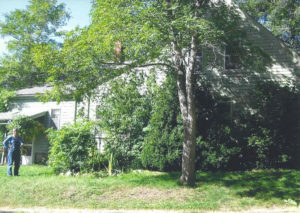 The Rogers/O’Connor cottage was available for a week in early August. So we packed up and we headed back to the Cape for another week of vacation. On the Wednesday morning of that week we were both off in different directions to start the day. Bill and the boys went out to our favorite breakfast spot and Joy went off for a run along the Cape Cod Rail Trail. On her way home, Joy spotted a small sign at the very end of the bike trail. She stopped and picked up a brochure about a nearby piece of property for sale. It looked very interesting and contained not one, but multiple 1800’s cottages and buildings hidden in the nearby woods. She raced home to show Bill. At just about same time, Bill and the boys were passing the driveway on the other side of the property and saw a small sign off the side of the main road; “Multi-Family Property For Sale.” He pulled over and took out the brochure. 10 acres hidden right through these trees? What was this all about? 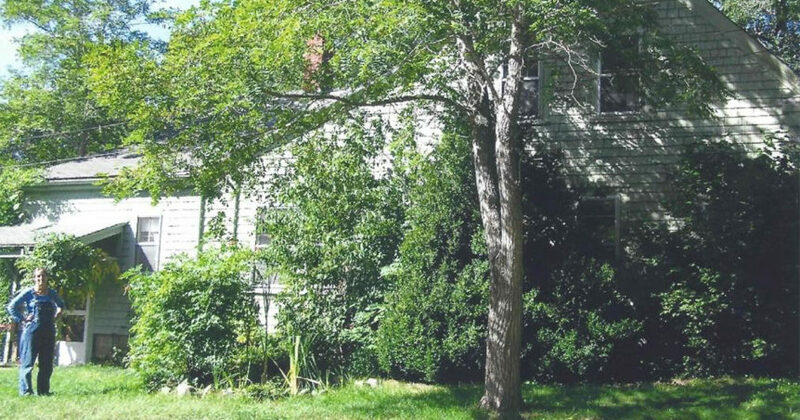 He could barely see the driveway through the overgrowth and had no idea that the little cottage right by the side of the road was part of the deal. The property had multiple buildings and was listed at a price that we might be able to afford! He rushed home to show Joy. Joy in front of the Main House at Hidden Hollow on the day we found it! They pulled in about the same time and jumped out to share their latest discoveries. “Look at this? What can this be? I never knew there were houses down that driveway by the hollow, did you?” We decided to go back and take a peek at what was hidden behind the trees. So we all drove back together to check it out. We came upon several run-down buildings covered by huge bushes; two houses (it wasn’t until later that day that we found out the Road House was also part of the property), an old barn and dilapidated shed held up by poison ivy and black oak tree branches. Cat brier and wild rose bushes were everywhere. We peered through the windows of the main house and saw an old player piano sitting quiet and alone in the living room, seemingly waiting for a new family to call this place home. We instantly fell in love with the place and the potential that it had. It turns out that this property, just one mile from the Rogers/O’Connor cottage, had already been on the market for almost 2 years. We had driven past this property for 2 summer vacations and never seen the “For Sale” sign! Yet on this Wednesday morning, on a week we were not even supposed to be in Wellfleet, we both found it independently? Serendipity and the spirits of O’Connor relatives long past were certainly at play that morning! The next installment … Finding a great Realtor and making the deal!